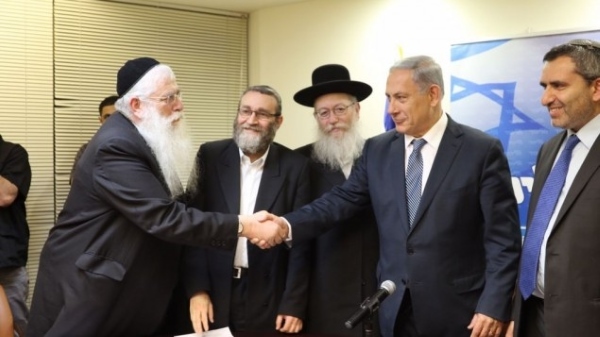 Likud’s Benjamin Netanyahu signs coalition agreement with United Torah Judaism party this week. (l-r) Meir Porush, Moshe Gafni, Ya’akov Litzman. I have great respect for those Jews who are more observant than I am. I made my personal decision about the degree of observance that is right for me, and for some that makes me an apikoros. But they have their way and I think I’m old enough to choose mine. Unfortunately, I find it necessary today to criticize the political expression of some of the more observant members of the Israeli Jewish community. Our broken electoral system, favors those who hold the balance of power in coalition negotiations. As a result, a small party can demand and get concessions that are more than minority rights — they become impositions on the will of the majority, sometimes to the real detriment of the nation. The coalition agreement states that the law will be amended so that the defense minister will have the authority to establish enlistment targets from the haredi sector, and that no sanctions will be imposed on any haredi yeshiva student who does not perform military service. Funding for ultra-Orthodox schools is to be unaffected regardless of whether they teach the required hours of core curriculum topics, and legislation is to be enacted guaranteeing this status. The agreement stipulates that the government will restore National Insurance Institute child allotments to their 2012 levels. And the agreement includes a stipulation that no legislation is to be passed that changes the so-called status quo on religion and state, effectively meaning that no reforms to issues of religion and state would be possible in the next government. Most of this is not good for either the State of Israel or the Haredim, who are isolated from mainstream Jewish Israeli society and will continue to be so if they do not serve in the army or study ‘secular’ subjects (for example, mathematics) in school. There is also tolerance of extremist, even violent, behavior toward those from their community who do serve in the army. In addition, their increasingly extreme and demeaning attitudes toward women are inconsistent with a modern democracy. Haredim do not have a monopoly on morality nor do they have a right to define Judaism for the Jewish world. It is not anti-Jewish to say that they, too, should try to understand and accept those who are less observant, and shoulder more of the burden of defending the state that makes it possible for them to live the kind of lives that they value. What were Netanyahu’s alternatives? The only one I see would have been a unity government with the ‘Zionist Union’, and that, too, would have been a slap in the face to the will of the majority of the electorate. The real solution is a change in the electoral system so that small parties do not have the ability to extort big concessions. Thank you Tzipi Livni for returning the misogynists from the Dark Ages to positions of power. I think the criticisms are fair – but have to be brushed because at this time Jewish unity is vital in the face of the threat from Iran and increasing pressure from the Obama Administration to compromise Israel’s independence and to force it into unproductive negotiations with the Arabs. In the face of this, the concessions to the Haredim are small potatoes in the larger scheme of things. They are reversible while what Iran and Obama want to do to Israel are not. So I’m at peace with them understanding Israel is a small country and getting a functioning government – not an ideal government – means making deals that have stuff in them most of us don’t care for and the international situation simply will not wait. Its a dangerous time for Israel and this should be kept in mind for the future. I cannot express how deeply disappointed I am by this surrender to the Anti-Zionist Charidim. It has made me regret voting for Prime Minister Netanyahu even though given the situation at election time I probably still would prefer him. What we really have to understand is that this boosting of the Anti-Zionist Charidim is against the long- term interest, and yes survival of the country as a whole. Who is going to fight for the country when such a large percentage of the Jewish population is freed of responsibility for doing so? What is the message in a competitive economic world when we will be producing as we do now so many illiterates in basic human skills? It’s shameful and disgusting especially in regard to Deri a convicted criminal being given so much power. Netanyahu favors the Charidim before the religious Zionists. He has done this before in regard to choosing Chief Rabbis. The Charidim do not threaten him. Our survival may be first of all dependent upon how we deal with external enemies. But promoting long- term weakness and injustice in our society also endangers us. The Anti-Zionist right is now in power and has kept the Anti-Zionist left out. Wouldn’t it be wonderful if the Zionist majority in the country could actually have the major say in determining our future?